Below are common attributes associated to Gala Apple Tree. Become a care taker for Gala Apple Tree! Below are member comments regarding how to plant Gala Apple Tree. No comments have been posted regarding how to plant Gala Apple Tree. Be the first! Do you know how to plant Gala Apple Tree? Below are member comments regarding how to prune Gala Apple Tree. No comments have been posted regarding how to prune Gala Apple Tree. Be the first! Do you know how to prune Gala Apple Tree? Below are member comments regarding how to fertilize Gala Apple Tree. 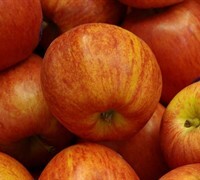 No comments have been posted regarding how to fertilize Gala Apple Tree. Be the first! Do you know how to fertlize and water Gala Apple Tree? Below are member comments regarding how to deal with Gala Apple Tree's pests and problems. No comments have been posted regarding how to deal with Gala Apple Tree's pests and problems. Be the first! Do you know how to deal with pests and problems with Gala Apple Tree? Looking for Gala Apple Tree? First, in most cases, you'll need to plant at least two varieties of apple trees for pollination purposes. Some apple varieties, such as Lodi, Liberty, Jonathan, Gala, Golden Delicious, and Granny Smith are labeled as "self-pollinating." These varieties are able to pollinate themselves but will produce more apples if they are cross-pollinated. Secondly, plant standard apple trees - one's which are not dwarf or semi-dwarf, about 25 to 30 feet apart. Standard apple trees are the hardiest and easiest to grow. Plant standard size apple trees in a location that provides full sun and a soil with a pH between 5.5 and 8.5, but preferably between 6 and 6.5. Apple trees like a rich, loamy soil but will grow in sandy or clay soil. Apple trees do not like wet feet so make sure whatever the soil type that it is well-drained. To plant a container-grown apple tree, dig the planting hole two to three time's as wide and not much deeper than the root ball. If your soil is clay-like or compacted, mix in some good organic matter at about a 30 to 70 ratio with the soil removed from the planting hole. Then set the root ball in the hole making sure that the bud union is about an inch or so above ground level. The bud union is where the root system meets the trunk of the tree (where the tree was grafted onto the root stock). Backfill the hole to the top edge of the root ball with the soil mixture tamping as you go to remove air pockets. Professional fruit growers use several different pruning and training methods for training apple and pear trees: Central Leader, Modified Central Leader, and Open Center or Vase Shape. Click on the link below to find instructions for the Central Leader and Open Center Methods. The Gala apple is a crisp, sweet and juicy apple with excellent flavor. You'll see this one in grocery stores all over America. It is medium sized, with rounded shape and has a golden yellow skin with a reddish orange blush. It will handle a considerable amount of summer heat and could be another choice to add to southern home orchards. It ripens mid-August to early September and requires 500 chill hours. Pollinator is required.